The Church is Romanesque in travertine with a semicircular apse and portal with archivolts and patterned frame carved with cherubs. 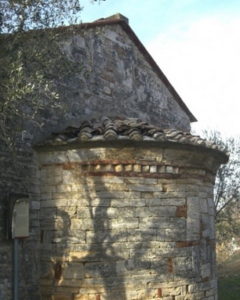 In the apse on a stone is inscribed with the date for MCI, perhaps referable to the foundation year. After years of neglect has been recently restored.